An Asian inspired Bok Choy Mushroom Stir Fry recipe. Counting carbs? Not a problem – no carbs here. It’s vegan and gluten-free! Over the past few weeks in China, D and I have spent more than our fair share of time in trains, train stations and the general vicinity. With the country so enormous we frequently have 12+ hour train rides every few days. Thankfully, China has an awesome train system with tons of routes, tons of seats and more or less on time service. We did have one painful journey where we had to take the hard seats on a night train from Beijing to Xian (about a 12 hour ride). Well more painful for D than for me I suppose. I had a table to lean my arms and head on and was able to sleep soundly after some help from Nyquil. D on the other hand had nothing to lean on and was left with a less than positive impression of the ride, as he was surrounded by loud noodle slurping, conversations and conductor announcements. Unwilling to take the hard seats again and with the hard sleepers all sold out we splurged for the soft sleepers. A whole different experience indeed! With a closed compartment shared with one other well-to-do (judging from their collared shirts) couple we drifted to sleep and awoke in Shanghai. No more spoiling ourselves though. Now it’s strictly the hard sleepers. With areas split up in 6 beds, 3-tired bunks on each side, by now I have tested out all the different shelves. Top bunk is significantly more claustrophobic than any of the others, though I suppose you get the most privacy. All of our bunk neighbors have been friendly and we even ran into a couple on the street from a previous train ride. Small world. With no shared language we could simple exchange ear to ear smiles and hand waving. That was the same train ride we went into hoping we would have the 6 bed compartment to ourselves. I mean we got lucky on the ferry from Japan to South Korea and had a 13 person room to ourselves so we thought this could be realistic too. Not so. Instead we ended up 8 people in a 6 person compartment thanks to a mother and her two young children. How to pass the time on all these trains? Cards, cards, cards. A perfect way to pass the time, and arouse the interest of all the Chinese people around you. For everyone back home with your smart phones connected to the internet at all times, you can always pass the time with words with friends, sporkle or even playing bingo online, whatever suits you. For us, we’re limited to cards, but it hasn’t gotten old yet. Well now that I’ve gotten that rant out, it’s time for a recipe. Today I share with you a bok choy mushroom stir fry. I just can’t get enough of the stir fries. They’re so simple to make, generally take minimal time and you can always get creative with the ingredients. This time I came up with a winning combination of bok choy mushroom stir fry. The more types of mushrooms the merrier too. And don’t skip out on the baby bok choy. This green vegetable is seriously adorable and even more delicious than all the other greens combined. Like tempeh better than tofu? Not a problem, use that instead. Watching your carbs? I’ve got you covered. This bok choy mushroom stir fry dish can be served over rice or noodles or just spoon it into a plate and eat directly. That’s exactly what I did so I know you’re not missing out. 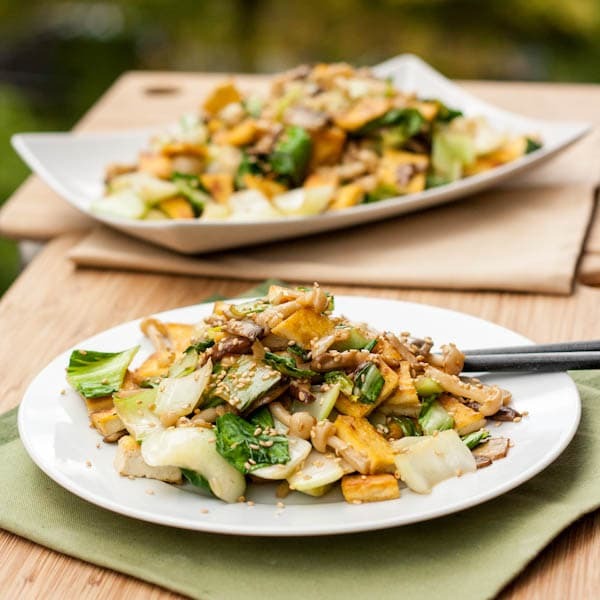 Let me know what you think of this bok choy mushroom stir fry in the comments below! Looking for more stir fry recipes? Check out my vegan soba noodle stir fry too! 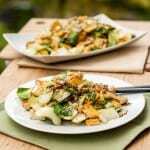 An Asian inspired stir fry recipe with Tofu, Mushrooms and Bok Choy. Counting carbs? Not a problem - no carbs here. 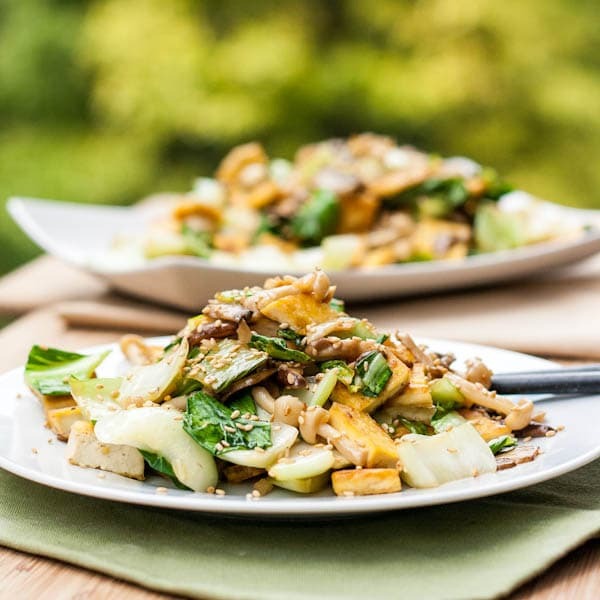 I know you'll love this bok choy mushroom stir fry. Heat wok over medium heat and add 1 teaspoon peanut oil. Cook tofu slices in single layer until browned on both sides. Continue until all tofu is browned. Add more oil if necessary. Remove tofu. Add sesame oil to wok and add baby bella mushrooms. Cook for a few minutes and remove. Add shiitake mushrooms to wok and cook for a few minutes then remove. Add enoki mushrooms to wok, cook for 2-3 minutes then add shiitake and baby bella mushrooms to the wok. Add garlic, ginger and baby bok choy and cook 2-3 minutes until bok choy slightly wilted. Add soy sauce and tofu back into the pan. Thanks!! Don’t worry, if I can learn to take decent food photos you can too!! I started with an old point and shoot and knew nothing about photography at all, let alone food photography. Let me know if you ever have any questions. Hope you enjoy this recipe if you try it out (don’t be afraid of tofu)! On a side note, seriously wish I had kitchen access right now so I could make your tofu coriander dressing! Tofu in dressing? Sounds brilliant! Can’t wait to try it! The more mushroom the merrier indeed! This stir-fry has my mouth watering already. Thanks for sharing your holiday train adventures and this wonderful recipe! Yes I looove mushrooms too! At a hostel here in Dali, China I found an amazing mushroom broccoli stir fry that I’ve already ordered 3 times in 2 days – just can’t get enough! Glad you enjoyed the recipe along with the adventures! Never a dull moment here in China! I LOVE stir fry and it’s been way too long since I’ve made anything with bok choy! Will definitely make this recipe next time I do stir fry! I LOVE it too and hope you enjoy this dish if you test it out. At a hostel here in China I found an amazing mushroom and broccoli stir fry that I love so much I’ve ordered it 3 times in the last two days! When you find something you like sometimes you want to eat only that! Tofu is great and so easy to cook into so many things. Firm tofu fried in the pan with a little soy sauce then served with potato and green sauce is a great vegetarian dinner. Just check the source of the tofu because it is soya beans and many of them are genetically modified which is something that I prefer to avoid. Good point about checking the labels to know where the tofu is really coming from. I too prefer to avoid genetically modified products! can I substitute the soy sauce for salt? Also will you be traveling to Hong Kong? I will be there soon and would love to read more about the cooking classes, sights and cuisines! I also hope to travel to Singapore and thailand when I’m there. Thanks! I’m so flattered! : ) I will eventually be traveling to Hong Kong but not for several months so looks like I may have to get my tips from you! This traveling blogging couple http://20yearshence.com/ just wrote a few posts on Hong Kong that might be helpful? When will yoube in Thailand? We will be there in January! I just realized I didn’t answer your salt question! You could try using the salt instead though I highly encourage using the soy sauce to give it that Asian flavor flare.